As Devizes has grown, the amount of open green space for children to play, for people to walk and just to provide open views has been reduced. The centre of the town has that wonderful “lung” The Green” which is safeguarded by our Town Council, but there are few other open areas and, where new housing had been built (often on such green space) nothing more than a small playground for children has been provided. There is ample evidence to show that having green areas where people can walk and children can play is extremely beneficial to the health of the community: indeed with children it is a useful tool against obesity. 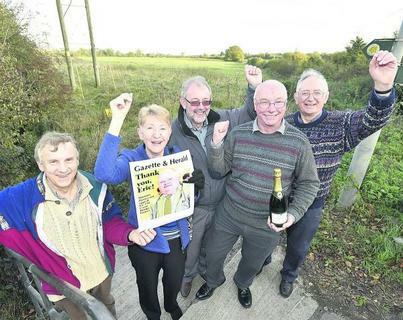 Developers continue to threaten our green spaces - the picture below shows campaigners enjoying the Secretary of State's decision to refuse planning permission for Coate Bridge - a decision that is now to be challenged in the High Court. Ensure that no more green land within the existing town is sacrificed for housing.